A ten-pointed nylon plastic structure which will fit any type of shoe (no adjustments required). Properly used, the Spider will provide an important margin of safety to the trekker who finds himself on snow, iced-over trails, wet grass and weather or simply hiking on steep, muddy terrain. A ten-pointed nylon plastic structure which will fit any type of shoe (no adjustments required). 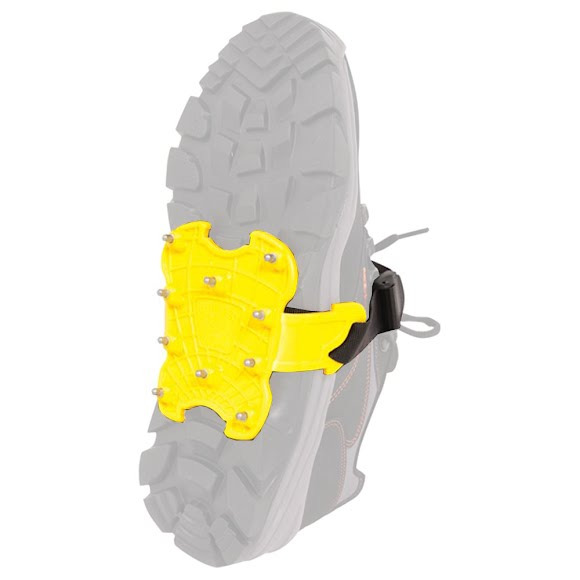 Properly used, the Spider will provide an important margin of safety to the trekker who finds himself on snow, iced-over trails, wet grass and weather or simply hiking on steep, muddy terrain. Also very helpful to hunters, fisherman and mountain photographers, Spiders are especially useful to professionals who encounter snow and ice on a daily basis in winter: park rangers, loggers and snow-making equipment operators at ski resorts. Mountain Rescue Teams will appreciate the fact that Spiders may be adjusted to any shoes without tools. CAUTION: the Spider is not a crampon designed for alpinism.